Children enjoy a visit with Santa Claus at the 2016 Christmas Tree Lighting Ceremony at the LBJ Museum of San Marcos. 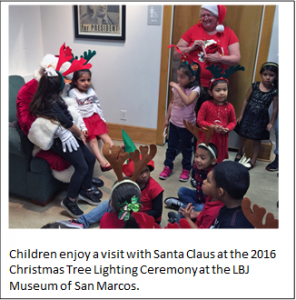 Children from Bonham Pre-Kindergarten School will help Mayor John Thomaides – with a surprise appearance by Santa Claus– light the Christmas Tree at the Lyndon Baines Johnson Museum of San Marcos on Wednesday, December 6, 2017. The public is invited to attend a reception at 4:30 p.m. and the ceremony at 5 p.m. at the museum, located at 131 N. Guadalupe St. The students of teacher Sara Rodriguez from Bonham Pre-K will sing Christmas carols. After their performance, Mayor Thomaides will congratulate the children—assisted by a surprise appearance by Santa. The children, Mayor and Santa will light the Christmas tree and take photos with the class. Santa will hear Christmas wishes and take family photographs. Parents are encouraged to take photos as well. Located on the San Marcos downtown square, The LBJ Museum was established in 1997 and opened in 2006 to honor the 36th President of the United States, a 1930 graduate of Texas State University. The museum offers exhibits of Johnson’s early years as a student and as a teacher in Cotulla Tx .that shaped his future political career. The LBJ Museum is free and open to the public from 10 a.m. – 5 p.m. on Wednesday-Saturday and from 10 a.m. to 3 p.m. on Sundays.